Demanding patients and cranky coworkers got you down? Transform your workplace – even if it may be full of bullies, blamers and belittlers! Join Sara Lefkowitz, RN, BSN, MPA, for this revitalizing workshop. Sara really understands nurses and the complexities of working in the healthcare environment. 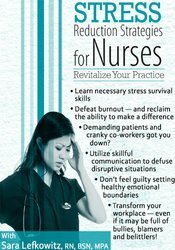 She has synthesized materials from important thought leaders in the fields of stress reduction, compassion and nursing to present to you powerful and useful tools to incorporate into your nursing practice. Multiple demands, fast pace, change and complex situations are common in healthcare environments. This leads nurses to experience the acute and chronic effects of stress. During the stress reaction, the body is flooded with stress hormones. Sara will demonstrate exercises to calm the nervous system. The goal is to develop mindful RESPONSES to stressful events in place of harmful stress REACTIVITY. Mindful responses to stress will help you stay balanced and focused in the midst of a busy day and increase the effectiveness of your nursing practice. Nurses work with people in crisis. We can become distressed and overwhelmed by other people’s trauma and illness. This contributes to burnout and compassion fatigue. Sara will teach you techniques to develop emotional boundaries and to work successfully with difficult emotions. Patients and colleagues want to feel seen and heard. The skillful choice of words and good listening can turn potential conflict into collaboration. Learn effective mindful communication techniques. Sara is confident that this workshop will help nurses regain their sense of vitality, purpose and desire to make a difference in the world. Enroll now for a life- and career-changing event! Apply stress reduction strategies in your professional and personal life. Explain the components that contribute to burnout. Practice in-the-moment stress relief techniques including Four Square Breathing, Mindful Check–In and STOP. Differentiate between toxic and healthy workplace environments. Apply mindful communication techniques to patient care scenarios. Evaluate new techniques to process difficult emotions. Create a realistic self-care plan. Recognizing your stress reactivity pattern: Are you a Fight, Flight or Freezer? Sara Lefkowitz, MPA, BSN, RN, is a dynamic and engaging speaker who presents highly-acclaimed seminars on Stress Reduction for Nurses throughout the United States. She has firsthand knowledge of the challenges that nurses face through her years working in large urban hospitals on medical surgical units and in the emergency department. Being a wife and mother, she understands the difficulties of juggling family and career responsibilities. Sara is a tenured nursing education professor in Northern California where she specializes in teaching medical surgical nursing. She has served as the assistant director of the nursing program and has worked extensively on course and curriculum development. In 2013, Sara took a yearlong sabbatical to learn practical techniques to help the stressed out, overworked nurse. She studied Mindfulness-Based Stress Reduction (MBSR) and trained as a MBRS facilitator. She studied Vipassana Meditation at Spirit Rock Meditation Center. She learned compassion practices through the study of Vajrayana Buddhism with Tara Mandala founder Lama Tsultrim Allione and her authorized teachers. Sara uses these practices every day to cope with the stresses of daily living, personal losses, and her tendencies toward overwork and burnout. Financial: Sara Lefkowitz is a tenured nursing faculty for College of Marin. She receives a speaking honorarium from PESI, Inc.
Nonfinancial: Sara Lefkowitz is a member of the American Nurses Association; and the San Francisco Bay Area Tara Mandela Sangha. Nurses completing these self-study materials will earn 6.3 contact hours. Expires: 9/28/2021.